If you are into weird music, then this new Italian album called Kinderheim is for you. Italian musician Davide Mezzatesta (AKA Mezz Gacano) and his RIO band the Self Standing Ovation Boskàuz Ensemble present 17 oddly named compositions that are all over the map. Some are semi-classical compositions of woodwinds, piano, and strings. Others are dissonant minimal jazz rock chamber music compositions. Most of these outré instrumentals are complex yet raw. There are numerous comparisons to Frank Zappa and Robert Fripp without sounding derivative. Davide even sports Frank Zappa-esque facial hair. 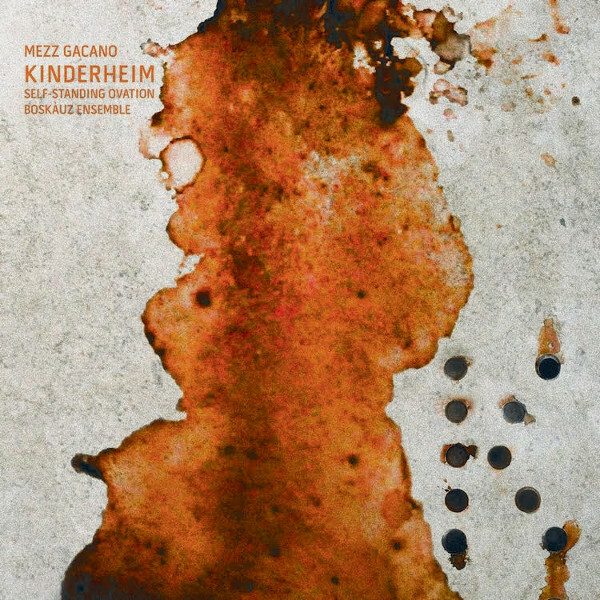 Make no mistake, Kinderheim is difficult music and fortunately with the first 16 tracks ranging from one to four minutes, that is the proper duration to fully develop each idea and not turn off the listener. One track that I found different from the rest is “Cerchio di Permità Gravemente” with its delicate toy piano in counterpoint to groaning, grunting, cramping sounds. The closing track “Bitter(n) Stormy over Vesuvio,” a reference in name only to the Henry Cow track from Unrest, "Bittern Storm Over Ulm," as there is no musical resemblance, is somewhat of an anomaly at nearly 21 minutes. After the first two and a half minutes of interweaving lines of drums, sax, and guitars it all goes silent for ten minutes. Then the remaining eight minutes features singing, talking, lots of random stuff, death metal, and what most people would consider to be “normal” music. Since there is no explanation, I cannot determine if the ten minute gap is intentional or a mistake, and if the first two and half minutes is supposed to be “Bitter(n) Stormy over Vesuvio” or if it also includes the end as well. Or if the final eight minutes contains experiments they decided to leave out but mistakenly included. Whatever the case, Kinderheim is one strange album that is in a class all by itself. Approach with caution.